Many men are happy to receive crochet gifts that show that you took the time and energy to create something just for them! Defy the "sweater curse" that haunts many crafters (and is just plain untrue!) and use these top 10 crochet patterns to make a gift for a man in your life–be that a father, husband, boyfriend, son or even a donation to charity! You'll never agonize over Father's Day, birthdays, or Christmas gifts again. 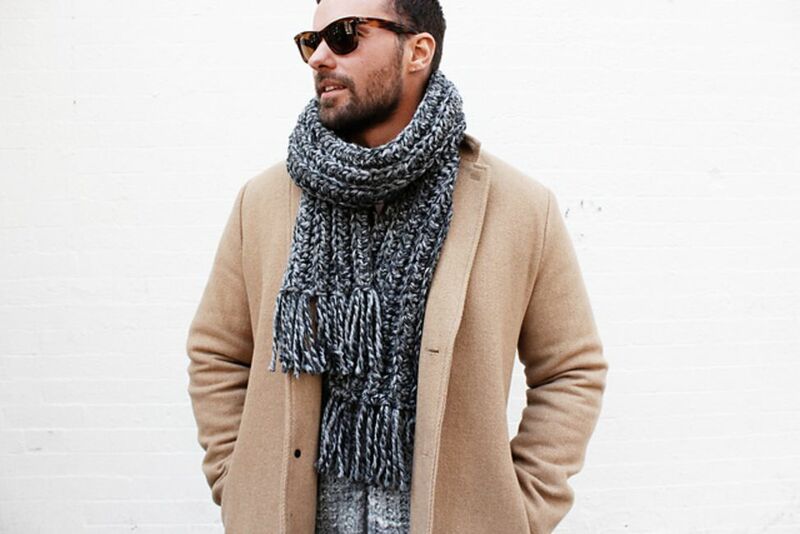 One of the most common crochet gifts for men is a cozy scarf. This particular design is a really warm winter scarf worked up in super bulky yarn. It is worked entirely in half double crochet stitches, some of which are worked through the back loop only to give the scarf a classic ribbed design. Long fringe works as a terrific accent in this thick tweedy yarn. Make a man in your life smile with a gift of crochet socks decorated with a moustache. These socks are made using a soft tweed yarn perfect for making crochet gifts for men. The pattern is worked in single crochet, with graph-based color changes for the mustache portion of the design. It's easy to learn the graph; each dot on the graph corresponds to one single crochet in the row, and the color of the dots is the color yarn to use. With lots of photos, this crochet pattern is easy to follow and gives you a lot of great information about the construction of a sock. This pattern is designed for a size 13 men's foot. Bulky yarn and simple stitches are go-to choices when designing crochet gifts for men. We see it again here in this winter mittens pattern worked in half double crochet with simple decreases to create the shape. Giving someone a pair of slippers lets them know that you see all of the hard work that they do and want them to have restful downtime. 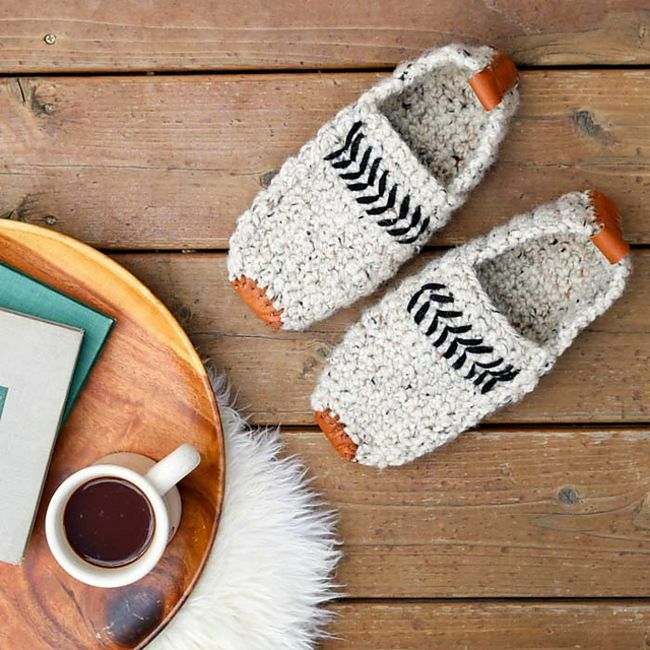 Giving a man a pair of crochet slippers lets him know that you care enough to craft for him personally! These crochet slippers have added leather soles that make them extra functional and particularly stylish. They're made with super bulky wool yarn so that they craft up quickly and keep his feet especially warm. This pattern is available for four men's shoe sizes–from 6 to 13. It is also available as a women's crochet slipper pattern, for a matching his-and-hers pair. Of course, not all crochet gifts for men are intended for winter, so there are also some great patterns available in lightweight yarns. Try this free Aran weight crochet pattern for men's fingerless gloves. Ribbed details for both design and fit are created using post stitches and a simple color change appeals to the eye. Make a quick crochet gift with this one-skein worsted weight slouch hat pattern. The written pattern, available for two sizes, is accompanied by instructional crochet videos to simplify crafting. The stitches are designed to offer a faux-knit appearance. This is the perfect crochet gift for the man in your life who loves coffee. Make him a hat that he can wear anytime. Add a mug and some coffee to it as a special bundled gift set. Although crochet slouch hats and beanies are the most popular choices for men's hats, there are some men in our lives that appreciate a little more flair. This pork pie hat is a perfect choice. This is a surprisingly versatile hat pattern. It is a unisex design written for many sizes from baby through extra large men's. Use it to crochet gifts for the whole family. There are many mommy-and-me matching crochet patterns out there, but not nearly so many for dad and sons. This crochet cowl pattern is an exception to the rule. It is worked in worsted weight yarn, with a simple color and stitch change that enhances the style of the accessory. It is written for two sizes–one child and one adult. The pattern was designed to match an existing crochet hat pattern by a different designer. The reversible hat pattern is designed for men, but can be adjusted to make a boys' hat if you're a skilled crafter. (Tip: Changing the size of your hook to a smaller size will help reduce the size of the hat.) A third designer has also made a matching crochet scarf pattern for those men and boys who don't like the tightness of cowls around the neck. Defy that ridiculous myth of the "sweater curse" and craft a handsome pullover for the man in your life using this cabled crochet pattern. It really is one of the best crochet gifts for men! This worsted weight yarn pattern is written for five sizes, from small through 2x. Not sure what to gift to Dad? Try a crochet necktie!